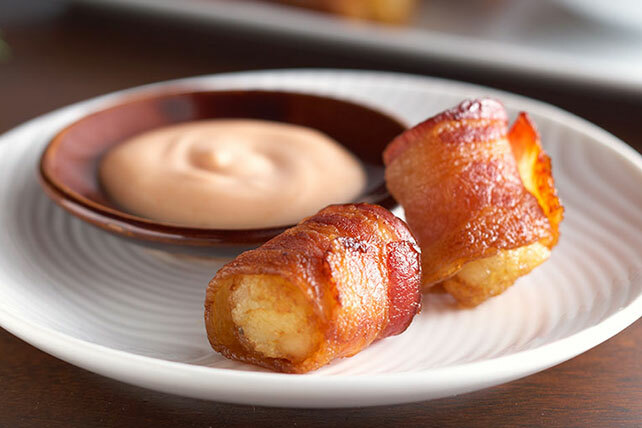 Wrap anything in bacon for a crowd-pleaser, like these Bacon-Wrapped TATER TOTS®. These Bacon-Wrapped TATER TOTS® are great for any party-goer. Wrap TATER TOTS with bacon; place, seam sides down, on rack of broiler pan. Bake 25 min. or until bacon is crisp, turning after 15 min. Meanwhile, mix mayo and ketchup until blended. Serve TATER TOTS with mayo mixture. Substitute HEINZ Chili Sauce for the ketchup.